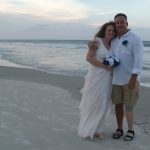 On Saturday July 25th in New Smyrna Beach, Fl, at Hiles Blvd beach, Anton and Angela were married in a glorious blue and white decorated event. The wedding included the eight children, parents and friends of the bride and groom. 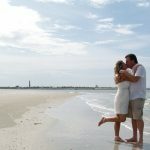 It was a 9:30am wedding in July with perfect beach weather. I was honored to officiate the ceremony with Angela’s dad, a pastor in attendance. Angela wanted him to just “be dad”! The couple chose the Sara two post bamboo arch with 24 chairs, tiki torch aisle markers, standard photography and ceremony music.